I’ve been down to stay chez parents again this weekend, and as it was mother’s day today I cooked a meal for my (unfortunately poorly) mummy. She had said a couple of weeks ago that she wanted to try my crispy lamb so that’s what I did, almost exactly as before, although I slow-cooked it in the week, poured about a pint of fat off of the top and froze the meat and broth separately so that there wouldn’t be too much prep involved today. I was worried that there wouldn’t be enough to feed everyone, as my family is made up primarily of boys who like their food (a lot!) 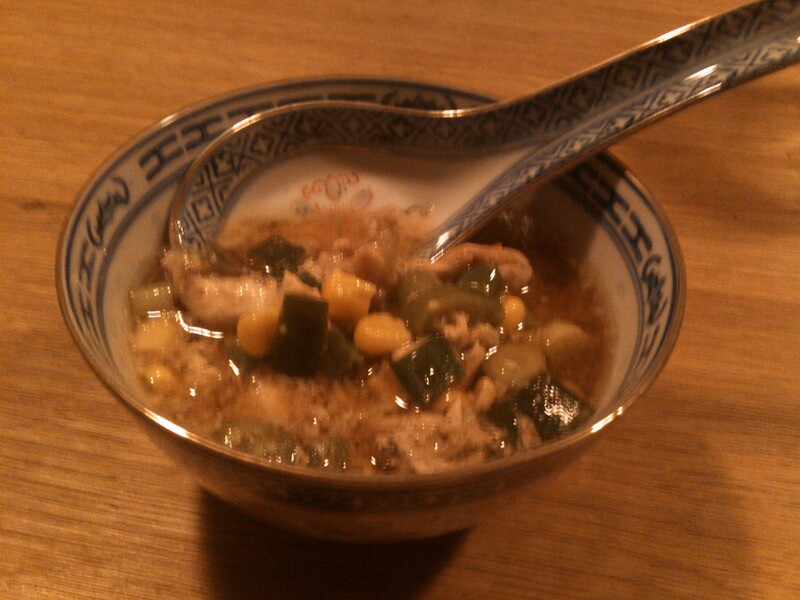 so I made a chinese-style soup served in tiny china bowls as a starter. I must admit, I was bloody pleased with it and everyone commented on how nice it tasted 🙂 It’s good to make the stock the night before the soup, so it has a chance to set. I had really wanted corn on the cob, but it’s out of season and the tinned stuff worked brilliantly. Youngest brother was in charge of dessert and made an old-style steamed syrup sponge with custard. It was beautifully light and melt in the mouth; the recipe came from a Good Housekeeping cookery book which had belonged to my mum’s mum and so it seemed fairly fitting to use it today. Although sponge pudding is really quick and easy to make in the microwave, it’s worth taking a couple of hours to tie a muslin round the basin and steam it over the hob as the quality is much much better. I hope all the mums reading this were suitably spoilt by their offspring today! Crappy phone-photo makes it look really unappetising, but I promise it was yummy! And probably really good for Mum as you're supposed to eat chicken soup when you're not feeling well, right? Joint the chicken and remove the meat from the bones (see here for a tutorial on portioning poultry). Chuck the bones and jumpy bits into a pan and cover over with cold water. Bring the carcass to a boil then turn down to a low simmer to make a stock. If possible, you want the stock to be quite gelatinous, so it needs to be cooked for quite a long time. Cool the stock once it’s cooked. Cut the chicken into very thin strips and refrigerate until required. Remove the carcass from the stock. Strip any cooked pieces of chicken from the bones back into the stock and cool completely (hopefully until the stock sets). Discard the carcass. You can keep the stock in the fridge for a day, or freeze it if you don’t plan to make the soup immediately. Chop the spring onions into small pieces (scissors work well) and stir through the stock. Add the sweetcorn (you can add the water too, if it hasn’t had sugar and salt added), 2 tablespoons of soy sauce, 1 teaspoon of sesame oil and 2 teaspoons of chilli flakes. Stir well. Mix around 3 heaped dessertspoons of cornflour with cold water. Add this and the chicken to the cold stock. Just before serving the soup, heat everything through on a medium-low heat. You should only need to cook it for a few minutes, until the strips of chicken have poached and are cooked all the way through. Before serving, taste the broth and add more soy or chilli to taste. Add more cornflour and water if the soup is not thick enough.